Narrowly missing a straying child, you steer your heavy shopping cart through an aisle of brightly colored cans, looking in earnest for your favorite brand of chunky tomato sauce. Your cart comes to a screeching halt as you notice your favorite chunky blended sauce is now a little more expensive than you remember. Just as you are about to give up hope you notice a similar blend of sauce to your left. As you pick it you notice that this sauce looks strikingly similar to your usual purchase. You glance down at the price, filled with glee that this particular brand of chunky blend sauce is significantly cheaper. Without a moment’s hesitation you place it in your shopping cart along side the other private label brands that are beginning to outnumber the flashy name brand items. If you’re like most Americans, this story may seem all too familiar to you. 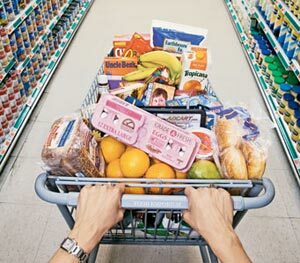 According to a recent Market Force study, 96 percent of consumers are buying private label grocery store brands. It wasn’t too long ago that store brands were looked down upon for being “low quality” and “cheap” however, many big box stores have adopted a new marketing strategy to their private label brands to create wide appeal for these otherwise ignored products. In 2011 Walgreen’s unveiled their high quality brand Nice!™. Their strategy was to focus on quality and improve the shopping experience, attracting consumers of all income levels. Stores like Home Depot and Target have also enhanced their own private label brands positioning them in a way that is synonymous with both quality and value. While the recent economy may have played a factor in the rise of the private label, quality packaging and branding has played a large role as well. Stunning colors, clever designs, and an overall clean look increasingly found on more private label brands will continue to attract more consumers, making private label brands become the “new normal”.